ABOVE: Why commute all over the map when you can stay near the pushpin? We occasionally receive e-mails from readers who want advice on staying outside the city. Our reply is simple: "Don't." If you plan to spend most of your time at Disneyland Paris, it makes sense to stay in or near the park. If the main reason for your trip is a visit to the Palace of Versailles, it's reasonable to stay in Versailles. 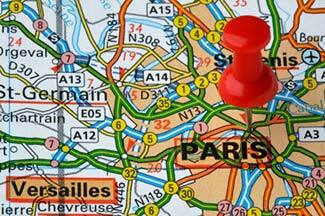 However, if the primary focus of your trip is Paris, then stay in Paris. You'll save money on transportation, you'll avoid unnecessary commuting time, and you'll still be enjoying the city at night when workers and tourists from the suburbs have gone home. In many countries, suburbs are considered safer and more desirable than the inner city. That isn't true in Paris, where crime rates are higher in some inner-ring suburbs than they are in the 20 arrondissements, and where people who have a choice usually prefer the city center. Our advice: Leave your city-vs.-suburbs preconceptions at home and enjoy Paris as the locals do. Map scan copyright © John Verner.